it's that mythical area that we have carried over the days of print. when we printed advertisements in newspapers, we wanted everything to be above the fold because readers would fold those massive acre sized sheets of newsprint into a more manageable field of vision. you basically knew how people would fold the page, in half like when they got it, or in quarters, folding the half over on to it's self, perpendicular to the original fold. those dimensions are concrete. but the fold in email, well one only needs to look at one of the email rendering services or to google "below the fold for html email" and the measurements range from 250 pixels to 650 pixels. where is the consistency in that? so that brings us to the example i just got. 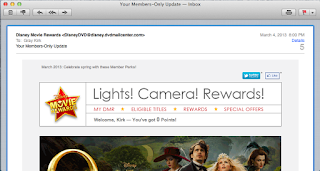 it's the latest communication from disneydvd and it's promoting the upcoming release of "oz the great and powerful". by why is it such a violator? well, the message is lost on the viewer, because it's well below the fold and not even in the preview pane. what's even worse is that they did a cool treatment to the oz promo - an animated gif. say what you will about them, are they annoying, do they increase click thru, do the engage the reader, are they a resource hog or just a way to increase the size of the email and put deliverability at risk; they are cool. illustrate and make sure you saw it. i have to say that i am a bit astonished that disney - the company that thinks of everything - didn't play with the layout and graphic sizes so that all of the design dollars and time for producing this animated gif could be viewed right at the top of the email and within the preview pane. that would have made this email even more engaging, especially since they are promoting 'oz the great and powerful' so heavily. *full disclosure, i'm a huge disney fan and i can't wait to see this movie (in 3-d) this weekend!